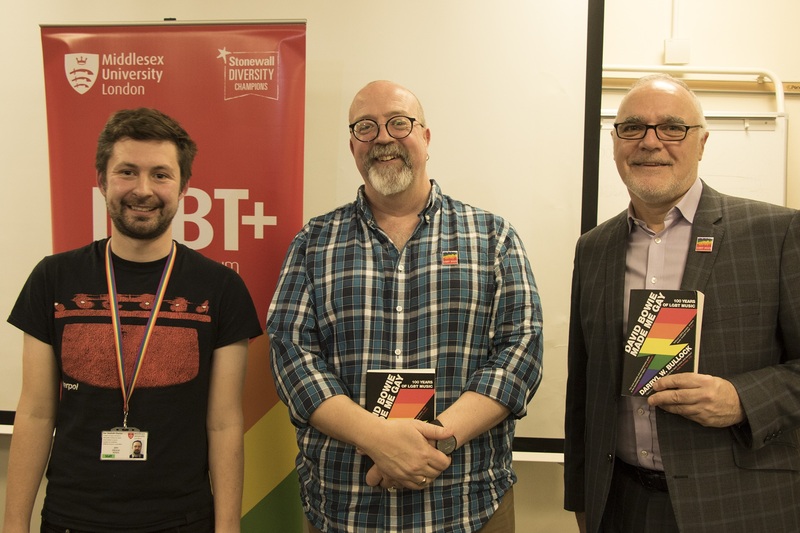 Stories about Freddie Mercury and Joe Meek and lively discussion about queer artists in today’s pop scene kicked off a series of events marking LGBT History Month organised by MDX's LGBT+ Everyone Else Staff Forum. LGBT History Month originated in the US and was first held in the UK in February 2005, with the aim of celebrating the achievements and the diversity of and counteracting prejudice against the LGBT community. The LGBT+ Everyone Else Forum is one of a number of equality forums at MDX, open to all staff, students, alumni, business partners, friends and members of the local community to help the University continue growing as a place where everybody feels comfortable. Stonewall picked out events held by the Forum for praise in assessment feedback for the 2019 Equality Index, in which MDX rose 24 places. On February 6, the Forum hosted author Darryl Bullock for a Q&A about his best-selling 2017 book David Bowie Made Me Gay, which chronicles one hundred years of recorded music by LGBT artists. Darryl, a former HMV store manager, said that while the book’s title is a wry joke, Bowie was (along with John Lennon) an artist he felt deeply emotionally invested in and is "the ribbon who tied the whole thing together". In conversation with host John Gilchrist, Darryl described his discovery of the first gay song of the recorded music era, copyrighted in 1916, by black gay Chicago musician Tony Jackson; contrasted the sexual openness of the 1920s with the atmosphere after the Second World War; and lamented how for years after Bowie and Dusty Springfield came out as bi, many artists were afraid to reveal their sexuality because of the imagined effect on their careers. His next book, due out next year, will tell the stories of gay managers and record company bosses who between them created the British pop industry in the 1960s and 1970s. Events at MDX later in the month include a "Craftivism" session combining craft and activism on 19th February, a screening of 1990 documentary Paris is Burning about the 1980s Harlem drag ball scene on 20th February, an LGBT+ exhibition in the Quad on 21st and 22nd February and a panel session discussing queer women's experience on 25th February. The MDX Corporate Engagement team website is hosting three blogs a week by staff and students reflecting on LGBT history, changing society and their own experiences until the end of the month at https://www.mdxcorporate.com/blog/ Blogs published so far include Student Engagement Coordinator Rosie McKenna describing the homophobia she encountered growing up in Northern Ireland, and Mental Health lecturer Alfonso Pezzella setting out a history of attitudes to homosexuality in psychiatry. David Williams, MDX's Director for Corporate Engagement and co-chair of the LGBT+ Everyone Else Staff Forum says that with respect to LGBT history, we are all "standing on the shoulder of giants", and also only at the start of a journey towards universal respect. "It's a responsibility for the university and the Forum to educate about history to build for the future", David said.